Please note that advanced search currently works for "My Contacts" only on our web app. 1. What are the advanced search operators and syntax? 2. How can I search for contacts added to my account at a certain time? 3. How can I search for contacts containing certain keywords/notes? What are the advanced search operators and syntax? Quotes (“ “) Exact Phrase Used to search for an exact phrase. Capitalization is not taken into account. Example: "John Smith" - Meaning: Contact contacts the exact phrase "John Smith" (case insensitive) somewhere in the record. Please note: all queries will stem unless a word or phrase is surrounded by quotations. For example, the query 'Steve "Smith"' would return results for both Steve Smith and Steven Smith but not Steve Smithwick. AND And Used to search for a contact that contains all the terms in the query. AND must be used in all caps. Example: "John AND Smith" - Meaning: Contact contains both the words "John" and "Smith" somewhere in the record. Please note that AND is the default operator for searching multiple words or phrases in FullContact search, so it can be omitted in favor of simply writing both words or phrases in the query. OR Or Search for contacts matching term A or term B. OR must be used in all caps. Example: "John OR Smith" - Meaning: Contact contains either the word "John" or "Smith" somewhere in the record. NOT Not Search for contacts that specifically do not include the term. NOT must be used in all caps. Example: "NOT John" - Meaning: Contact does not contain the word "John" anywhere in the record. Example: NOT tag:"friends" Robert. This will return a list of Roberts that do not have the tag "friends". > < Greater than/Less Than Example: "added>YYYY-MM-DD" - Meaning: contact was added after YYYY-MM-DD. given: Given Name Search for a given (first) name. Example: "first:John" - Meaning: Contacts that have John as the first/given name. family: Family Name Search for a family (last) name. Example: "family:Smith" - Meaning: Contacts that have John as the last name/family name. company: or organization: Company or Organization Search for contacts that have the search term as their current company/organization. Example: "company:FullContact" or "organization:FullContact" - Meaning: Contacts that have FullContact as the current company/organization. title: Job Search for a matching job title. Example: "title:CEO" - Meaning: Contacts that have CEO as their current job title. email: Email Address Search for matching email addresses. 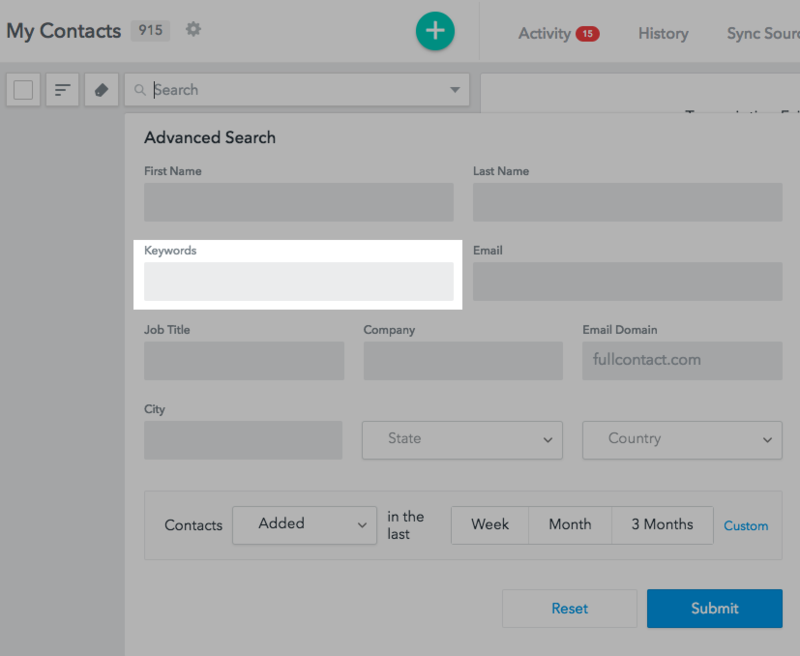 Example: "email:john@fullcontact.com" - Meaning: Contacts that include "john@fullcontact.com" as one of their email addresses. domain: Email Domain Search for matching email domains. Example: "domain:applefullcontact.com" - Meaning: Contacts that include "john@fullcontact.com" as one of their email addresses. url: URL Search for matching URLs. 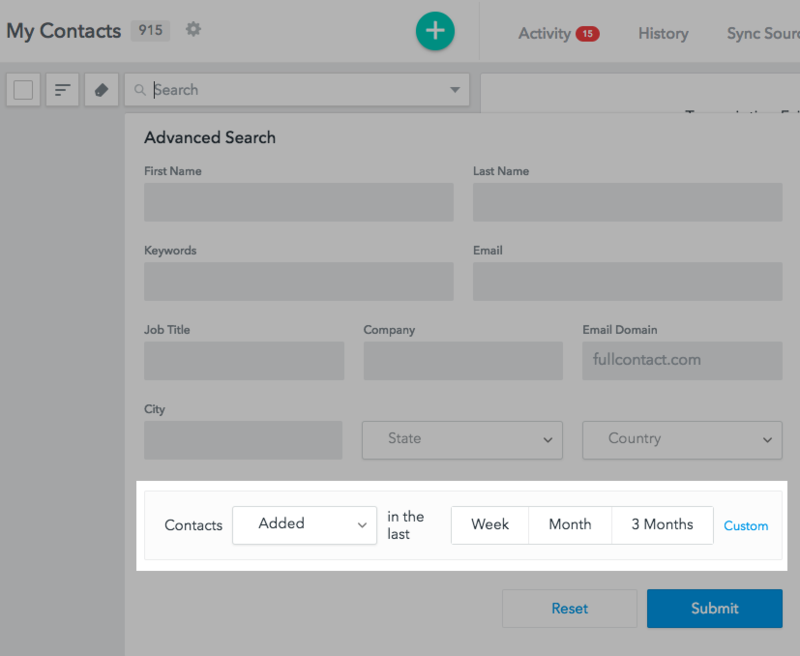 Example: "url:https://www.fullcontact.com" - Meaning: Contacts that include a URL with "https://www.fullcontact.com"
created Created Date Search for contacts created before, after, or on a certain date (using the date format mm/dd/yyyy) Example: "created>2014-09-12" - Meaning: Contacts that were created after September 12, 2014.
modified Modified Date Search for contacts modified before, after, or on a certain date (using the date format mm/dd/yyyy) Example: "modified<2014-09-12" - Meaning: Contacts that were modified before September 12, 2014.
notes: Notes Search for words or phrases in the Notes field. Example: "Notre Dame" - Meaning: Contacts that have the word "Notre Dame" somewhere in the Notes field. city: City Search for contacts with a specific city. Example: "city:Denver" - Meaning: Contacts that have the exact word "Denver" (case insensitive) as the city. region: Region Search for contacts with a specific region. Example: "region:Colorado" - Meaning: Contacts that have the exact word "Colorado" (case insensitive) as the state. country: Country Search for contacts with a specific country. Example: "state:United States" - Meaning: Contacts that have the exact word "United States" (case insensitive) as the country. missing: Missing Search for contact missing a specific field. Example: "missing:email" - Meaning: Contacts that do not include an email address. Example: "missing:tag" Meaning: Contacts that do not have a tag. Example: "missing:phone" - Meaning: Contacts that do not have a phone number. tag: Tag Search for contacts that have a specific tag. Example: tag:"family". This will return a list of contacts that have a tag of "family". birthday: Birthday Search for contacts by birthday. any: Any text anywhere in the contact Search for a specific text in all fields of all contacts. Meaning: Contacts that have "Creative" in any of the fields apart from tags and relationships. How can I search for contacts added to my account at a certain time? You'll want to use the Advanced Search in the Web app. How can I search for contacts containing certain keywords/notes? To note: you can also search keywords, company names, job titles, etc. in FullContact for Mac, FullContact for iOS, FullContact for Android, and FullContact for Gmail.